It seems a little odd now that next year, 2017, will see the tenth anniversary of the collapse of the US housing market. Thanks to the greed of the Wall Street banks, in the US alone, eight million people lost their jobs and six million people lost their homes. It was a national scandal. But how did it all come about? 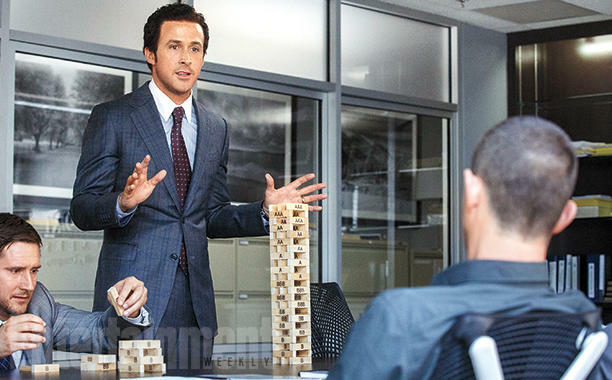 Well, it’s fairly complicated, but The Big Short does a good job of explaining it all. 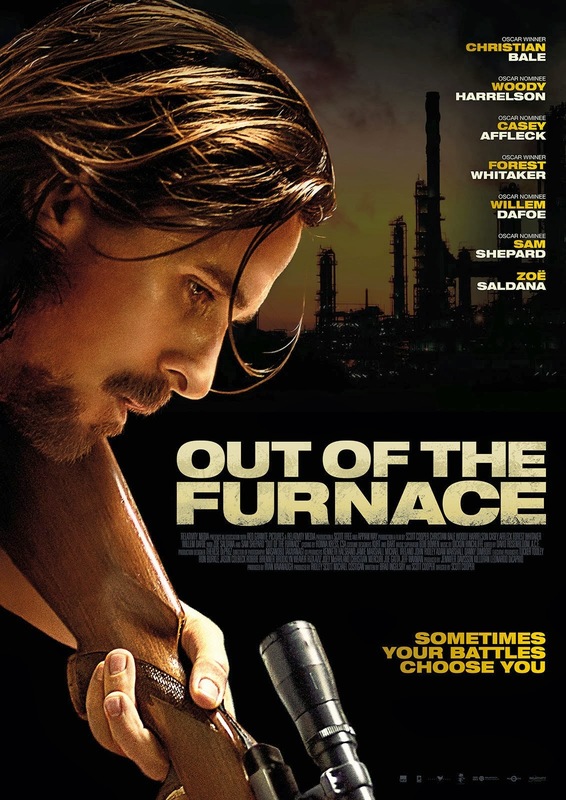 Adapted from the book by Michael Lewis, the movie looks at the people who first realised that the US housing market was a timebomb waiting to happen. It begins with a hedge fund manager, Dr Michael Burry (Bale). He had been analysing mortgage lending practices and discovered that mortgages were being sold at an alarming, and unchecked rate. With increasing defaults at the lower end of the market, a collapse was inevitable, and Burry predicted it would happen in 2007. Burry then approaches several of the big name banks, including Goldman Sachs, and persuades them to let him take out credit default swaps, an insurance against the collapse happening. If it does, they pay him a major return on his premiums. 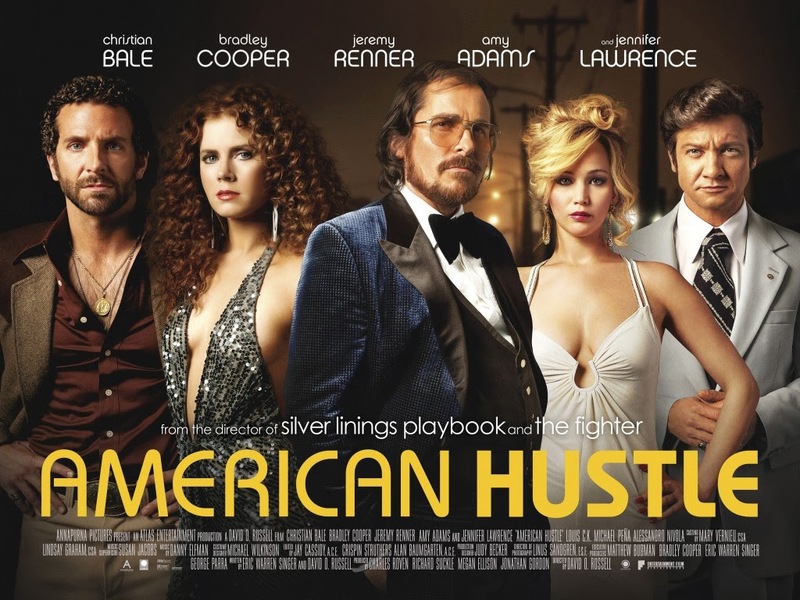 Burry’s actions attract the attention of a trader at Goldman Sachs, Jared Vennett (Gosling). At first, like everyone else, Vennett thinks that Burry’s idea is completely ridiculous. But he does what Burry did and digs a little deeper, until he too sees the likelihood of the collapse happening. 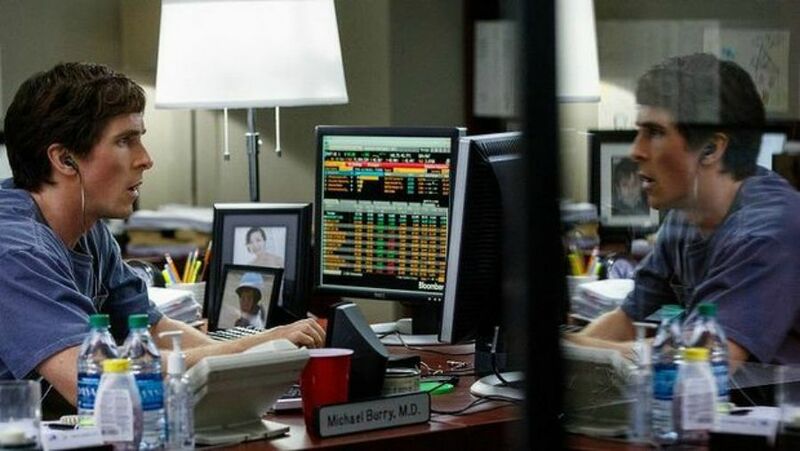 He attempts to do what Burry has done using his own funds but a misplaced phone call ends up putting him in touch with Mark Baum (Carell), another hedge fund manager. Baum and his small team begin to create their own credit default swaps. In addition, two young investors, Charlie Geller (Magaro) and Jamie Shipley (Wittrock) hear about the default credit swaps, and with the aid of industry veteran Ben Rickert (Pitt), they too manage to raise their own swaps. Burry faces the ire of his bosses at the company where he works (who can’t see that the housing market could collapse – because it’s never happened before) because of the size of the premiums he’s paying, while Baum’s investigation into the pending collapse begins to show the enormous effect it will have on the public, as well as the financial system. The sheer size and scope of the fallout, they realise, won’t just affect the US economy, but the global economy as well. As Baum and his team look further into the reasons why the collapse will occur, they discover that the banks and mortgage lenders are complicit in keeping the status quo, preferring to get rich off of short term investments instead of long term ones. And they also discover the existence of CDO’s (collateralized debt obligations), groups of poor loans that are packaged together and given incorrect ratings in order that they can be sold on. These packages are essentially worthless but are being used to a) prop up the already wobbly housing market, and b) to further ensure quick, easy profits for the banks. But it all proves to be too much and too late. In 2007 the markets defaulted and the collapse began in earnest. The ripple effect of foreclosure after foreclosure began to cripple the banks, and many closed for business, owing billions of dollars (the movie states that $5 trillion was lost in total). But – and here’s the irony – Burry, Baum, Vennett, Geller and Shipley all profited from the collapse. Their credit default swaps allowed them to make millions off of the back of everyone else’s misery. The movie acknowledges this around halfway through, and while up til then the viewer might be regarding these guys as the heroes of the story, by the end it’s doubtful you’ll see them in the same light. When Burry leaves his office once his company’s credit default swaps have been honoured you see the amount they’ve made written on a board: $2.69 billion. 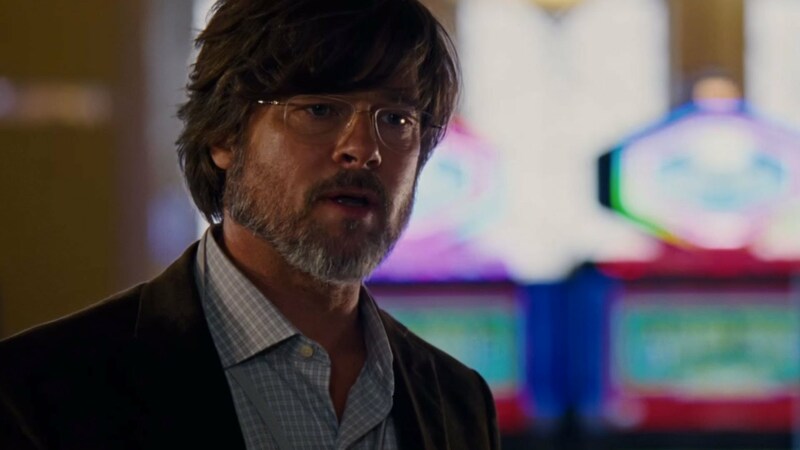 By focusing on the people who warned the system what was going to happen, and who benefitted from it in the long run, The Big Short is able to show us what was happening on the inside, and how pervasive the fraud related to mortgage lending was. It’s a morality tale where no one gets off lightly. Geller and Shipley, once they realise the effect the collapse will have on ordinary people they try and warn their friends and families, but they’ve made no effort to warn anyone else during the whole time. Baum approaches one of the Ratings agencies, to see how they can justify giving approval ratings to the CDO’s, only to be told that if they didn’t the banks would take their business elsewhere; and yet Baum doesn’t warn anyone outside his own team about what this means. And Burry sits back in his office and watches it all unfold with the view that he’s just doing his job. That the US financial institutions of the time were amoral in their approach to protecting their clients is something we’ve long been aware of, but the point The Big Short makes with absolute clarity is that everyone was too busy getting rich to even care. What makes matters worse is that the banks weren’t even worried; they knew that the government – the people, if you like – would have to bail them out if anything did go wrong. It’s this nasty, reprehensible lack of responsibility, and the extent of it, that really comes across, and even though Baum in particular bemoans the industry’s fraudulent activities, it still remains that few efforts were made to avoid the collapse when it was known about and accurately predicted. As the movie’s anti-heroes, Bale is on nervous, Asperger’s-type form as Burry, supposedly with a glass eye (the left one), and working with absolute certainty that his projections are correct. Burry is a character that comes across as indifferent to anyone around him, and dismissive of others when challenged, but Bale makes him into a weary financial warrior, determined to make a profit for his investors at the expense of millions of ordinary non-investors. He’s likeable enough but some viewers may find him cold and distant. 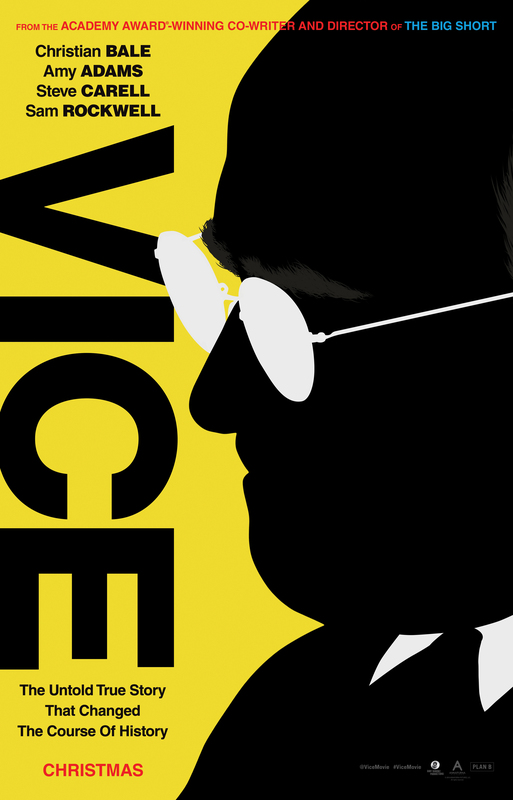 Carell plays Baum as the script – by McKay and Charles Randolph – has set him up: as the tale’s sole source of any conscience. With an unflattering wig perched on his head to add to his woes, Carell looks crestfallen and morose throughout, as if the weight of the (financial) world was all on his shoulders alone. It’s less of a performance than an extended mope-athon, and aside from a few moments of outrage, Baum looks and sounds like someone who’s got inside the cookie jar, has stuffed them all in his mouth, and only then discovered that he doesn’t like the flavour. 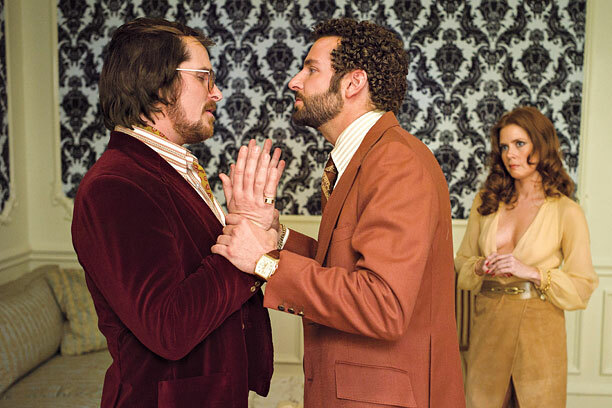 In support, Gosling sports a hideous hairstyle and struts around breaking the fourth wall with undisguised glee (as do several other characters), while Pitt buries himself beneath another odd wig and a scruffy beard. Magaro and Shipley adequately put across the eagerness and the excitement of being in on what could be termed an “industry secret”, and their scenes together are eloquent for how they go from earnest and enthusiastic to demoralised and dismayed. The rest of the cast do well with sometimes sketchily written characters, though Mann comes in towards the end as an investment manager that the banks use to create synthetic CDO’s (even worse than the real thing) and who is scarily unconcerned about the consequences of what he’s doing. McKay – better known for his work with Will Ferrell – has made a movie that exposes the indolence and the greed at the heart of Wall Street during the last decade, and he’s done it with no small amount of style. When something complicated needs explaining, instead of getting one of the characters to explain it, the movie is effectively paused while a celebrity does so in terms that the average viewer can understand (which leads to the surreal moment when Selena Gomez explains what synthetic CDO’s are). With the intricacies of the financial jargon overcome, McKay looks to emphasise the human cost of the banks’ endeavours and does so with a pointed, judgmental approach that can be hugely effective. 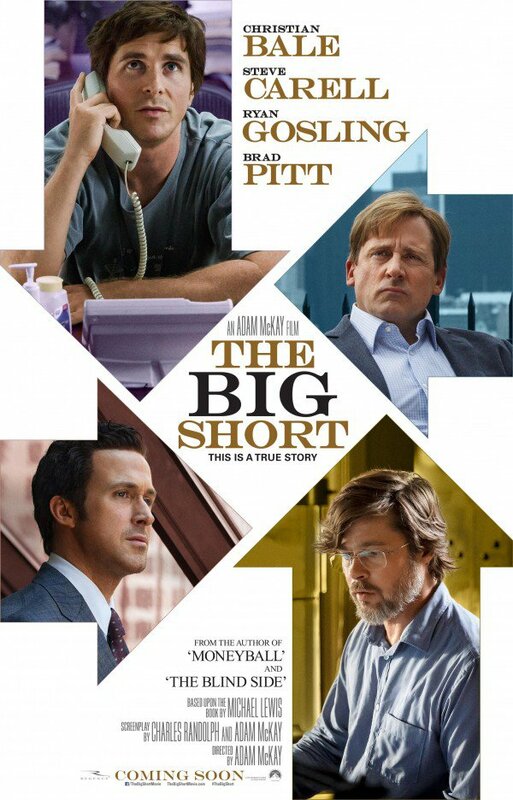 The Big Short may not be everyone’s idea of a movie to crack open a few beers with, or indeed one that could be enjoyable, but there’s much to warrant giving it a try, and if you pay attention to what’s being said, there’s a lot to be understood about what went wrong in 2007 and why it was inevitable. As a cautionary tale it’s perhaps a little too late in the telling, but it does leave the viewer with one very clear warning right at the end: beware of “bespoke tranche opportunities”. They’re the new version of CDO’s and the banks are pushing them with all the gusto did in the past. 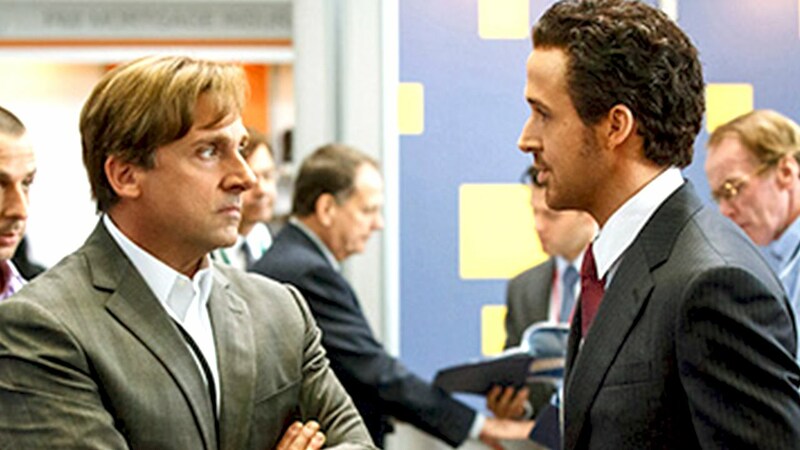 Rating: 8/10 – well focused on both the financial and human sides of the crisis, The Big Short is a scary look at a situation that nearly caused a global financial meltdown, and why it came about; fascinating and horrific on a continually WtF? level, the movie is at its best when its skewering the antipathy and the greed of the banks and their seemingly pathological determination to screw over everybody for the sake of a quick buck. Ancient Egypt, 1300 BC. In the holy city of Memphis, Pharaoh Seti (Turturro) has learnt that the Hittite army is nearby. He sends his two sons, Ramses (Edgerton) and Moses (Bale) to rout them, which they do, but not before Moses saves Ramses’ life on the battlefield, thus fulfilling a prophecy that says one of them will be saved by the other who will become a leader. When they return, Seti orders Ramses to travel to Pithom in order to assess the slaves working there. Moses goes instead and meets the Viceroy, Hegep (Mendelsohn). Hegep is crooked and treats the slaves poorly. During his visit, Moses meets a man called Nun (Kingsley) who tells him that he is a Hebrew and that the circumstances of his birth are not as he believes. Moses refutes this and returns to Memphis, but the story is overheard and reported to Hegep. Soon after, Seti dies and Ramses becomes Pharaoh. 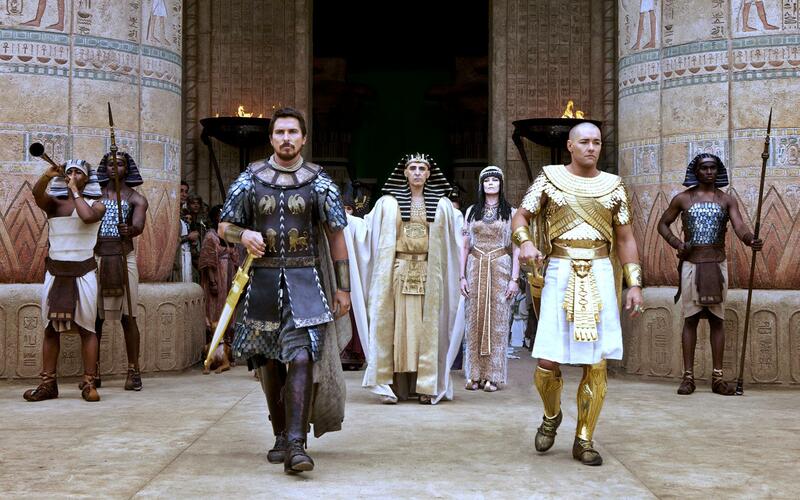 When Hegep comes to Memphis he tells Ramses of Moses’ history; this leads to Moses being sent into exile. He travels to Midian where he settles down as a shepherd and marries Zipporah; they have a son, Gershom. Meanwhile, Ramses marries Nefertari and they too have a son. Nine years pass. During a storm, Moses pursues some stray lambs onto a nearby mountain. A rock slide renders him unconscious; when he comes to he finds himself confronted by a young boy, Malak (Andrews) who is God’s messenger. He gives Moses a task to do, one that brings him back to Memphis and a meeting with Ramses where he warns the Pharaoh to set the Hebrews free or there will be consequences. Moses prepares the Hebrews for conflict, while Ramses targets them in the hope that Moses will give himself up. But Malak appears to him again and warns him that Moses’ lack of progress means “something is coming”. “Something” proves to be a series of plagues that wreak havoc on Memphis and the Egyptian people, culminating in a cull of all the Egyptian firstborns, including Ramses’ infant son. Ramses, in despair, tells Moses to take his people and leave. But once they’ve done so he takes four thousand men and pursues them all the way to the Red Sea, with the intention of slaughtering them all. It could be argued that the need for a re-telling of the Moses story isn’t exactly high on anyone’s agenda at the moment, but nevertheless here it is, and directed by one of the few directors able to orchestrate a movie on such an epic scale. 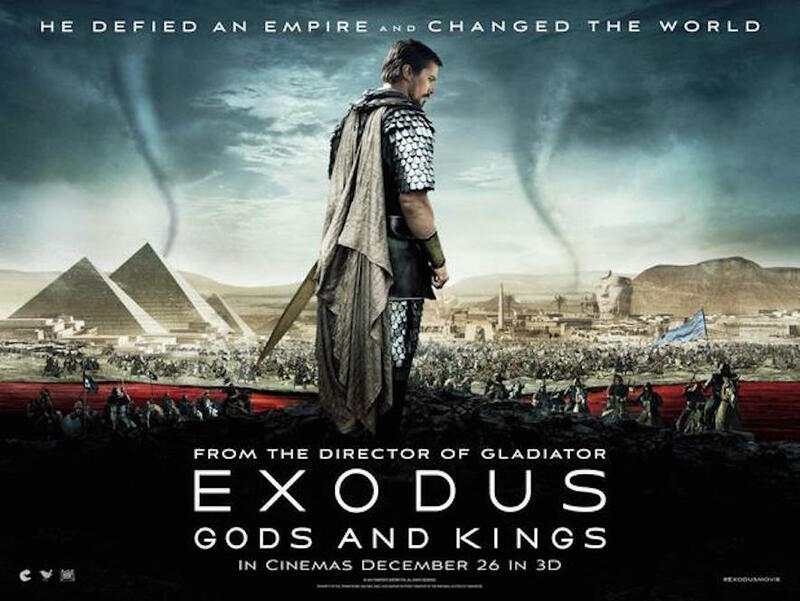 However, while Exodus: Gods and Kings is as visually impressive as you might expect given that Darius Wolski is behind the camera and Ridley Scott is overseeing things, the movie as a whole is a leaden, passion-free exercise in big-budget movie making. Considering both the material and the cast taking part, the movie struggles to engage the audience from the off, proving largely uninteresting and a frustratingly bland experience. As happens every so often with the projects Scott chooses – 1492: Conquest of Paradise (1992) and Hannibal (2001) are just two examples – Exodus: Gods and Kings is a) too long, and b) too tedious. With the story of Moses, the ten plagues, and the crossing of the Red Sea being one of the most dramatic Biblical tales, the fact that this incarnation loses its way so quickly (and never recovers) is a little embarrassing. 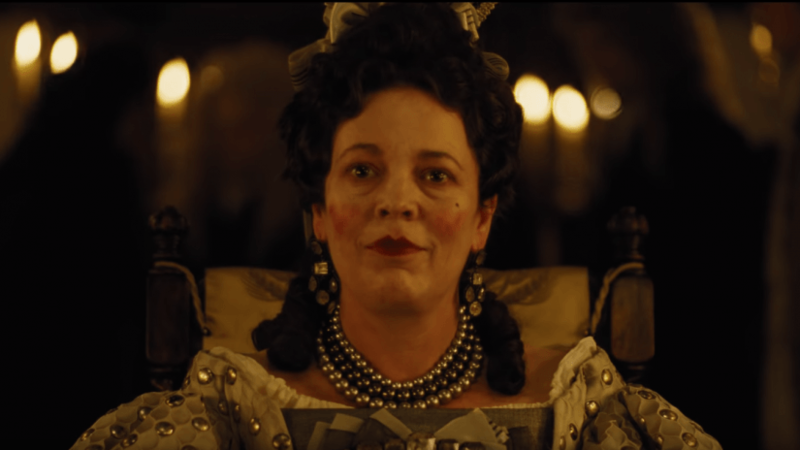 The criticism that Scott focuses too much on the design and look of a movie is upheld here by a range of performances that give new meaning to the word “undercooked”. 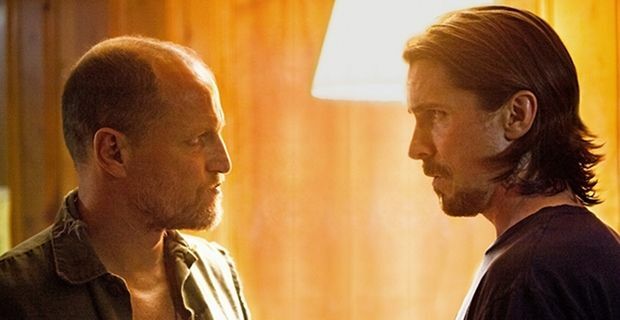 Bale’s portrayal of Moses lacks the intensity of feeling that the part demands, and his discovery of his roots is reduced to a brief scene that gives way to an even briefer fight scene; it’s as if he’s more irritated than devastated. Edgerton plays Ramses as an indecisive, self-doubting pharaoh who looks like he needs a comforter (or his mommy). As the dramatic foil to Moses, Ramses’ character carries all the weight of a feather duster, and Bale and Edgerton’s scenes together quickly become repetitive in nature: Moses shows his annoyance/anger/disappointment in Ramses, Ramses does his best not to look as if he’s going to cry. Thus any clash between the two is always going to be heavily weighted in Moses’ favour, but Bale never takes full advantage of the way the script orchestrates these encounters (he’s also able to get to Ramses without being detected, and to leave without being pursued). He and Egerton aren’t bad per se, but they don’t spark off each other. If it weren’t for the fact that both actors are clearly physically present in their scenes together, you could be forgiven for believing that they filmed them separately and were “united” in post-production. As for the rest of the cast, their roles are generally too small for them to make much of an impression, with the notable exception of Mendelsohn, who takes Hegep and invests him with a surprising mixture of flippancy and menace. 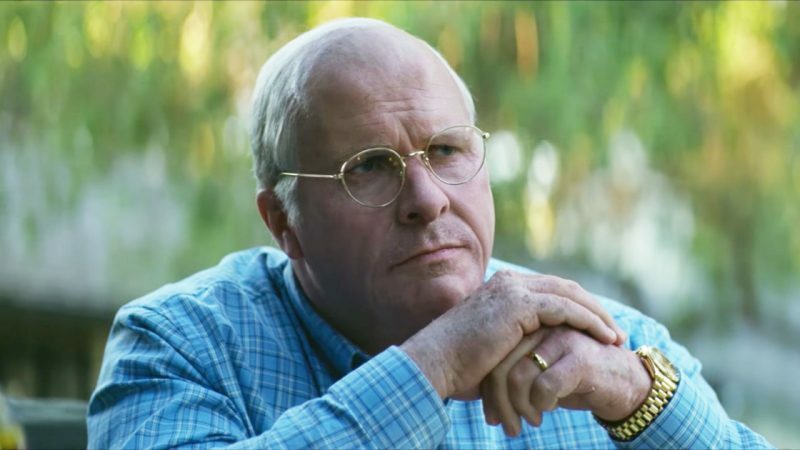 It’s the best performance in the whole movie, and when he’s on screen, the discrepancy between his approach and Bale’s (in particular) is all too apparent. In even minor roles, Weaver, Paul, Turturro, Kingsley and Farahani are there to make up the numbers, while Valverde is stranded by the script’s need to tick off the boxes in Moses’ life without providing any depth to it. It’s unfortunate, as well, that Valverde’s appearance is during the film’s middle section, where Moses strives to be a shepherd before his first meeting with Malak (there is a burning bush but with Malak acting as God’s mouthpiece, it just looks superfluous). 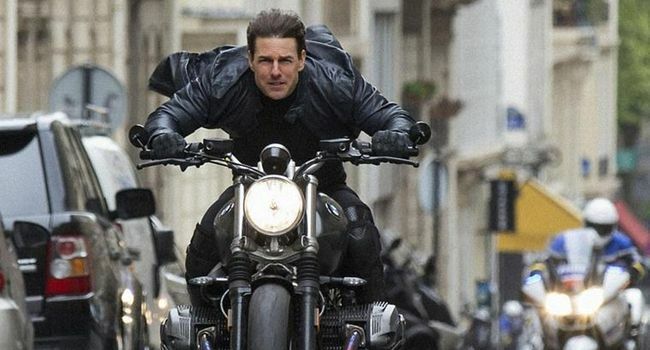 This stretch of the movie has all the pace of a snail race, and thanks to the indolent editing – courtesy of Billy Rich – seems to go on for much longer than it actually does. With so many scenes either dragging on or lacking in energy, Exodus: Gods and Kings regularly falls back on its special effects, but even here the spectacular appears commonplace, our familiarity with what CGI can achieve blunting the effect of seeing Memphis from the air, or giant crocodiles attacking ships on the Nile. It also leaves the crossing of the Red Sea, and its fast-approaching ten-storey wave, feeling less impressive and/or intimidating than it should be. Again, Scott and his cast and crew fail to heighten the drama and leave the viewer struggling to work out where everyone is in relation to a constantly changing topography (not to mention a wave that appears to be advancing from at least three directions at once). 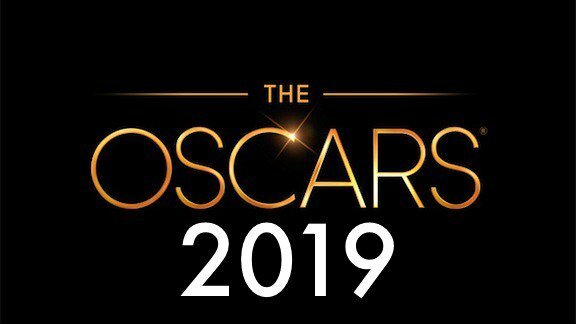 Scott’s ardor seems to have waned recently, with his last two movies – The Counselor (2013) and Prometheus (2012) – showing clear signs of a director unable to spot, or deal with, or overcome, the faults in each movie’s screenplay, and sadly, the same is true here. 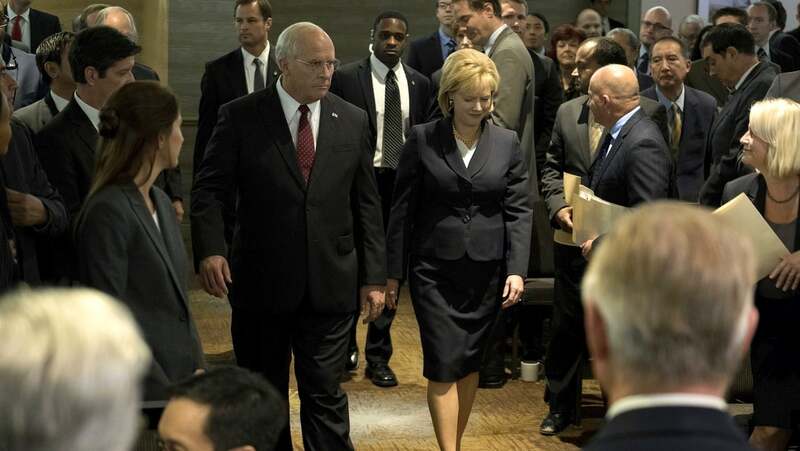 The script – by Adam Cooper and Bill Collage, with assists from Jeffrey Caine and Steven Zaillian – aims for intimacy amid the spectacle but ends up skirting it instead, and any notions of leadership, duty, fraternal betrayal, faith or destiny, rather than being placed front and centre, are given a passing nod whenever the movie appears to need them. Rating: 5/10 – visually stunning but dramatically redundant, Exodus: Gods and Kings is a disappointing, mediocre piece that fails to inject any fervour into the story of Moses and his efforts to free the Hebrews from the pharaohs’ tyranny; stilted and dull, this becomes as much an epic of endurance (for the audience) as it does for its characters.